Condo Culture | We’re in a giving mood this Friday. We’re in a giving mood this Friday. Happy Friday everyone. We hope you all had a great week. This week we we’re looking to get your opinion about what you like most about our weekly emails and how we can ensure you’re getting everything you need and for that matter, everything you want! As a sign of our appreciation, we’re giving out a very special something to a very special someone who gives us the best response as to what you like most about our weekly newsletter (or like least!) or how we can make the process of buying and selling condos the best it can be. Afterall, everything we do we do it for you (any Bryan Adams fans out there?) and we want to ensure each and every week we’re doing everything we can to get you the best content and deliver the best real estate experience on planet earth. Whether you’re currently touring with us to buy a new condo, are in the market to sell, looking to lease a unit, just trying to get a handle on the market, or currently live in a local condo and want to stay connected, we want to hear from you! So, here’s your chance. Tell us what you like or don’t like about the current newsletter, shoot us an idea for a future newsletter or send us your suggestion on how we can make the process of buying and selling condos even better for you! Simply reply to this email with your suggestion and the top suggestion received by midnight tonight will be selected and awarded the very cool and very functional Rock Bottom Vessel & Decanter shown above. This is one of the CC team’s absolute favourites (in fact, many of us have one at home and love them ourselves) and we’re sure it will soon become one of your favourites too. Use this bad boy to serve your reds at room temp when you have a friends over, throw the base in the freezer for a few minutes to keep your whites chilled or put the base in the oven to keep to keep tea or other hot bevies warm. There are endless uses for this handmade beauty. Fresh out of ideas this week but really want a vessel? Not to worry. 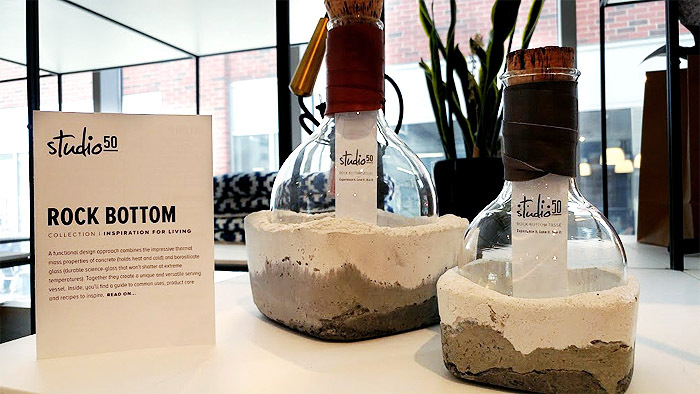 You can also purchase the Rock Bottom Vessel in any of our Condo Culture real estate stores while you’re in-store browsing the latest listings and newest local condo projects. Simply show us this newsletter on your phone on your next visit and get an additional 15% off. So fire us your ideas, suggestions or comments and get ready to serve your favourite red in style this weekend. This weeks winner will be contacted tomorrow with details on how to claim your prize!